The show will be held Saturday, April 21, from 10 a.m. to 5 p.m., and Sunday, April 22, from 10 a.m. to 4 p.m., at Father Burns Hall in Portola. Admission is $6. 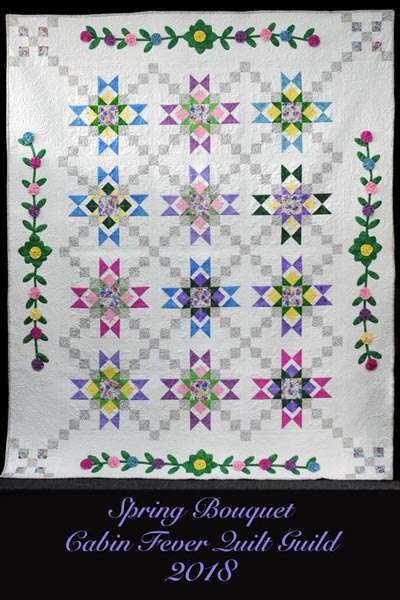 Kicking off the celebration of all things quilted and sewn, the guild is featuring an Opportunity Quilt titled “Spring Bouquet,” which measures approximately 82-inches by 78-inches and was made in blocks by all members of the guild as a group project. The Opportunity Quilt will be on display at Plumas Bank in Portola April 2 through 6, according to quilter Donna Crary. Tickets for the quilt drawing can be obtained at Plumas Bank, as well as at Homestead Fabrics for $1 each or six for $5. Proceeds generated by the show and quilt drawing are put to use in a variety of ways, for projects such as making quilts for wounded warriors and their companion dogs and for the furry friends at High Sierra Animal Rescue. The guild also puts together pillowcases stuffed with items for youth in the foster system. With the Cabin Fever Quilt Guild quite involved in the community, funds are also donated to Eastern Plumas Health Care and various athletic teams at Portola High School. The guild invites one and all to stop by Plumas Bank and check out the Opportunity Quilt up close, and looks forward to seeing the community at this year’s show.